Welcome to JamJar’s exclusive showcase range: short, “taster” print runs designed to show you just what we could do to promote your business. Luxurious yet affordable, bespoke yet accessible, our showcase products allow us to demonstrate our craftsmanship, service and commitment to excellence. For our newest Showcase we will be showing off the capabilities of our Indigo Digital Press; which boasts high quality printing to match litho colours, as closely as possible with digital print, and the ability to print on thicker stocks than a normal digital press. 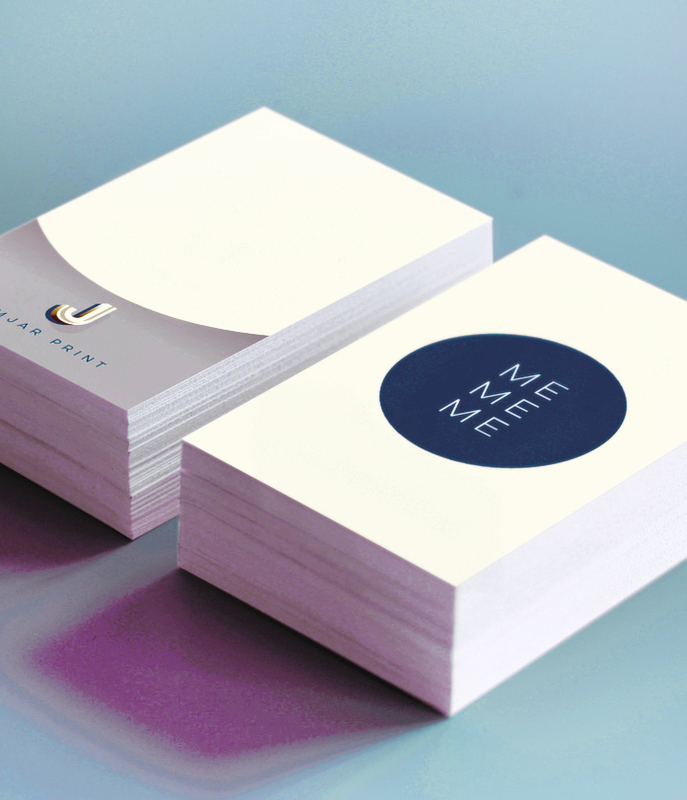 We will be offering a standard (5 working days) and express (2 working days) turnaround on two different finishes: 450gsm soft touch laminated and 400gsm uncoated. These will still be supplied in our custom made Showcase boxes, but delivered by standard courier instead (delivery charges apply). Full colour both sides (Indigo printed), 55x85mm, 450gsm silk with soft touch lamination both sides or 400gsm uncoated (select below). Prices subject to VAT and delivery. This is a website exclusive offer and cannot be ordered via e-mail. All artwork must be supplied correctly. Unlike all our other products, your showcase business cards will be delivered in a JamJar Print branded box! For the express turnaround option all orders received by 10am will be printed and dispatched the same day.